NEW DELHI. A fake post doing rounds on social media claims that furnishing their Aadhaar cards was mandatory for all the children and women who Prime Minister Narendra Modi met on Raksha Bandhan day, and only those who had their Aadhaar cards were allowed to tie rakhi on PM Modi’s wrist. The claim is based on a photo shared by official website of PMO India (www.pmindia.gov.in) and the Press Information Bureau (PIB), where a girl tying rakhi to Modi’s wrist has Aadhaar card in her hand. Not just Facebook, the claim is going viral on Twitter as well. The post has been shared multiple times across social media platforms. Many accounts on Twitter and Facebook also picked up the photo and gave it a misleading context, labeling Modi “shameless” and “coward”. However, as inferred from the pictures tweeted by PIB’s official Twitter account, almost every woman who tied Rakhi carried some identification, possibly as a part of PM’s security protocol. While children can be seen wearing their school I-cards, older women are wearing a badge, possibly from the organization they represent. The girl in question does carry an Aadhar card with her, because that’s the ID she chose to display at PMO. It could also be because she is a minor and that’s the only government ID she can possibly have at her age. And as explained, the entire exercise of carrying an ID proof, while meeting Prime Minister of India is party of the security procedure of meeting the executive head of India. 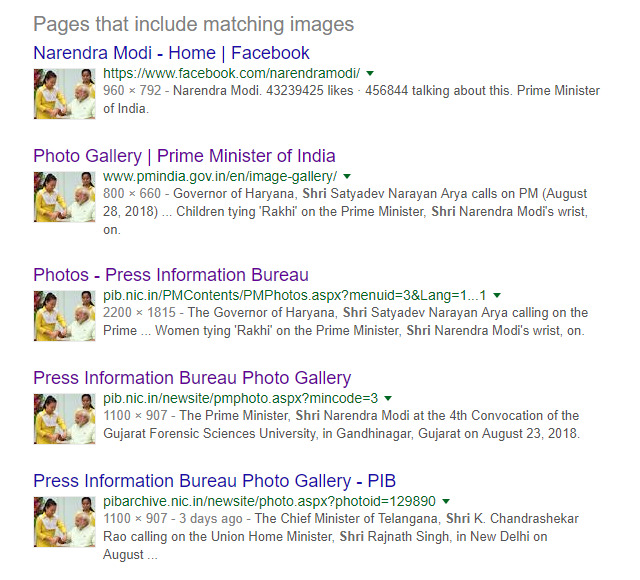 On doing a simple reverse image search on Google, the results showed that the photo was shared by many government affiliated websites and social media accounts. Times Fact-Check team has found that the claim to be fake. Our research established that the photo was indeed correct and not photoshopped, but the context given to is wrong.